A123 Systems today announced that it has expanded its business development partnership with IHI Corporation, one of the largest industrial equipment manufacturers in Japan, to more strategically meet increasing demand for A123's solutions in the Japanese transportation market. 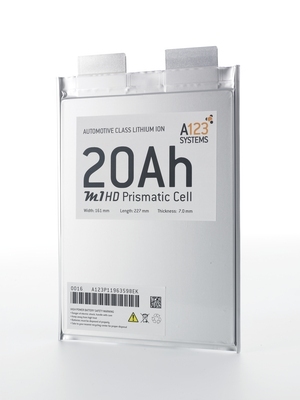 A123 will license its battery system technology to IHI, which will develop solutions for passenger and commercial electric vehicles in Japan using A123 battery cells. In addition, IHI will make a $25 million equity investment in A123. "Since first partnering with A123 in 2009, we have seen increasing interest in A123's advanced lithium ion battery technology for transportation and other applications. We believe that expanding our partnership enables IHI to address this growing market opportunity by commercializing innovative solutions powered by A123's batteries," said Taizo Suga, Associate Director, General Manager, Corporate Development Division at IHI. "A123's Nanophosphate lithium ion chemistry has proven to be among the highest-performing, most durable and longest lasting battery technologies we've seen, which we feel makes them optimal for vehicle electrification. We look forward to working closely with A123 as a technology partner, and we also believe our equity investment in A123 will demonstrate a meaningful commitment to our expanded strategic business relationship." Under the terms of a technology license agreement, IHI will be the exclusive provider of A123 battery systems and modules in the Japanese transportation market, licensing A123's advanced battery system technology and systems integration expertise to manufacture solutions for electric vehicles. It is expected that this will enable A123 to leverage the customer relationships IHI has developed with leading Japanese automakers. A related product supply agreement also establishes A123 as the exclusive supplier of lithium ion battery cells to IHI for transportation as well as non-transportation applications that IHI may develop as a future value-added reseller, which has the potential of creating new market opportunities for A123 technology across IHI's global businesses. "IHI is a well-established technology supplier to the Japanese auto industry , so we believe that expanding our relationship provides us with a strong strategic partner to help us more effectively and efficiently deliver our solutions to the Japanese transportation market," said Jason Forcier, vice president of the Automotive Solutions Group at A123. "Additionally, we believe that we have a competitive advantage as the exclusive provider of lithium ion battery cells to IHI for the licensed applications as well as potential additional applications beyond transportation, allowing us to capitalize on new market opportunities introduced by IHI's robust global network of businesses."